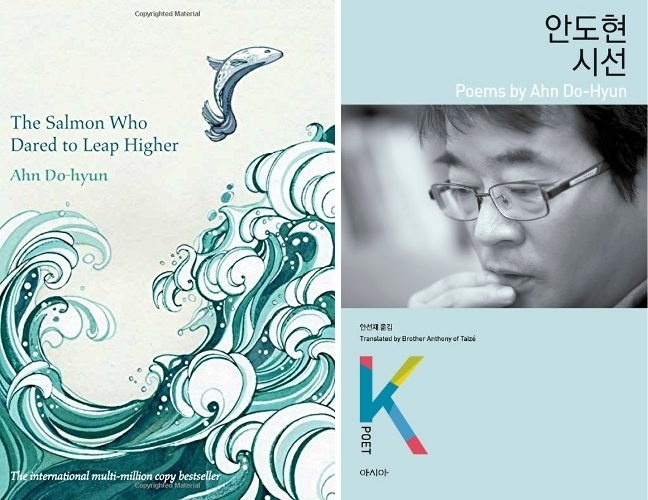 The covers of "The Salmon Who Dared to Leap Higher" and the new translated poetry collection by Ahn Do-hyun. Seoul Book and Culture Club will be hosting best-selling author and poet Ahn Do-hyeon on Saturday. Ahn’s main activity is poetry, for which his accolades include the Poetry and Poetics Young Poet Award, the Sowol Poetry Award, and the Baekseok Literary Award. But his best-known work in translation is “The Salmon Who Dared to Leap Higher,” a multimillion-selling story that has been made in English, French, and several other languages. A collection of poems translated into English by BrotherAnthony of Taize was recently released by Asia Publishers. Ahn Do-hyun and event host Barry Welsh will read some of Ahn’s poems together and talk about his work, with English interpretation, followed by a question and answer session with the audience and a book signing. The event runs at Seoul Global Cultural Center in the M Plaza building in Myeong-dong from 4-6 p.m. Admission is free.